Watch for black ice. Although it is mostly invisible, pavement with black ice will be a little darker and duller than the rest of the road surface. It commonly forms on highly shaded areas, infrequently traveled roads, and on bridges and overpasses. Use extra caution on bridges and overpasses. Bridges and overpasses freeze first and melt last. Therefore, use extra caution as the roadway leading up to the bridge may appear fine but the bridge itself could be a sheet of ice. Travel gently. Drive, turn, and brake slowly. Adjust your speed to the road conditions and leave yourself plenty of room to stop. You should allow at least three times more space than usual between you and the car in front of you. Be extra aware of the traffic ahead. If you see brake lights, fish tailing cars, sideways cars or emergency flashers, slow down even more. Control the skid. If you are approaching a patch of ice, brake during your approach. Applying pressure to your brakes while on ice will only throw you into a skid. In the event you find your car is skidding, ease off of the accelerator or brake, and steer in the direction you want the front of the car to go. To maximize stopping power and maintain control, squeeze the brakes with your toes. With your heel on the floor, squeeze the brake pedal gently with your toes. The anti-lock system will make the pedal pulsate. Don’t panic, this is normal. Continue to apply braking pressure. If your car doesn’t have anti-lock brakes, you need to use the following threshold braking technique: Squeeze the brake pedal with your toes, and, when you feel the wheels begin to lock, ease off the pressure slightly and hold it there. Guard against SUV overconfidence. Four-wheel-drive vehicles are great for initial traction and avoiding getting stuck, but once they are moving, they have the same difficulty keeping control and stopping as other vehicles. Never use cruise control. Cruise control is not recommended when ice is on the road as the driver should be in full control of the vehicle at every second. 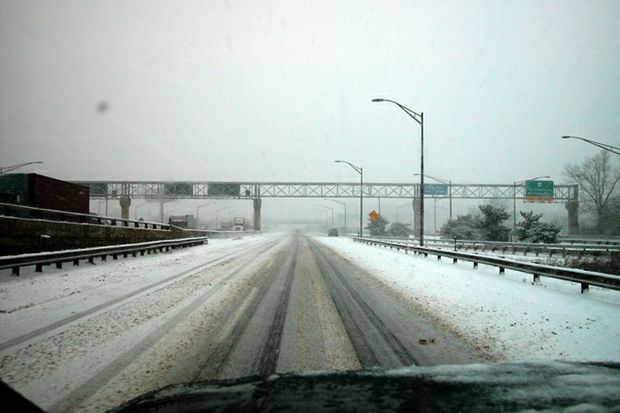 In addition, AAA urges motorists to have a winter weather kit in their car. Winter weather driving kits should include: a blanket, ice scraper, flares/reflective triangles, flashlight with extra batteries, jumper cables, bag of abrasive material such as cat litter, shovel, cloth/paper towels, and a cell phone with a full charge.